I don't know about real magic carpets, but I do know that the following rugs will definitely lift the energy in any room you place these in. They are graphic, bold, colorful and just really fun; the kind of rugs that I have been searching for. Granted, I've been trying to find them at a cheaper price, but I've learned that a rug can really make a room. So if it means droppin' some Benjamins on it then so be it. Coral Rug from Green Culture Rugs. Now, I don't know why but lately I have been gravitating towards the color combo red & white (hence the red & white garden stool from my previous post). I just think it's so crisp and bold and really eye catching. I find that you see a lot of blue & white items out there and while there is nothing wrong with that combo (I LOVE blue & white together) I just like to be different. I think that red is just that pop of color that really spices up a room and really you don't need much, maybe just a few touches here and there. 60" Medallion Rug from Urban Outfitters at $29.99. I normally don't think of round rugs, but this one has a great palette of cool grey, black and white. The grey almost appears like a light blue with hints of green in it, no? That's why I love the contrast of the black right next to the grey. 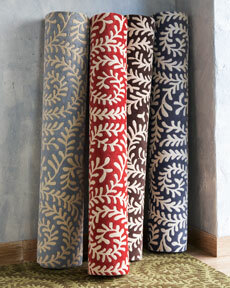 Vivienne Scatter Rug at Ballard Designs from $69.00 - $159.00. Eva Rug at Ballard Designs from $49.00 - $549.00. With names like Vivienne and Eva, that's enough reason to buy these rugs, but as you can see they don't even need the help of their names to sell me on them. The designs in both rugs evoke an old-world sensibility, but because of the colors chosen it becomes modern and fresh. Orange is quickly becoming a go-to color for me. It's a color that's just as cheerful as yellow, but is a great alternative so that you're not using yellow all the time. Zebra Rug at West Elm from $109.00-$749.00. If you're feeling really adventurous then this rug is for you. Place a modern rug like this in your house and I guarantee it will automatically make you look like a stylish decorator, promise! Plus the espresso & white compliment an array of colors, so you shouldn't have any issues trying to match furniture or accessories with it. So maybe it isn't as adventurous as one thinks? Margent Area Rug at Home Decorators Collection from $69 to $1499. If zebra stripes aren't really your thing then maybe a floral, black & white printed rug is more up your alley. This is one of my favorites that I am loving. The ivory keeps it on the subtle side while the black floral design gives it that modern punch. Another great example of a graphic rug that comes in 5 different colors. For those of you who are drawn to more traditional types of rugs, don't fret! I will be covering that at some point as well. But I am dying to get my hands on a modern, graphic rug so I had to share these ones with you. And don't forget, rugs are an investment piece, so spending a little extra $$ will be worth it.